This week I take a look at Caramel/Crystal malts and how it is different from kilned specialty malts from a flavor perspective. While most homebrewers are very familiar with caramel and crystal malts, few have a well developed understanding of the flavors provided by kilned malts. 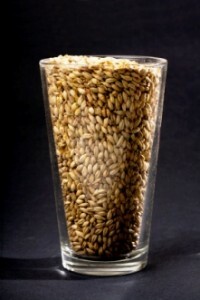 Malted barley starts by taking raw barley grain and germinating it by soaking in water. The barley seeds begin to sprout and are allowed to grow for a few days sprouting tiny leaflets and an internal sprout called an acrospire. When the acrospire is approximately the length of the grain, the grain is dried slowly in a kiln down to about 10% moisture. If dried slowly you can make pale or Pilsner malt. Darker colored base and kilned malts are made by heating the grains to a higher temperature part way through the drying process which can create grains of various darkness depending on the temperature used. This process can produce malts like pale malt, mild, vienna, munich, amber, bisciut, melanoidin and even brown malt. Crystal malts go through a different process. Instead of being dried and then lightly toasted they are left wet and heated close to mash temperatures where the temperature is held. This effectively mashes the sugars grain husk, converting them into a simpler, sweet form, They are then dried and if desired heated to higher temperature to produce the range of crystal malts from the very light Carafoam to very dark crystal like Special B. They are inherently sweeter, have more dextrines and produce very different flavors than the comparable kilned malts. Because of the different processes used, the two malts produce a very different flavor profile. Crystal malts in general produce many fruity flavors that are characteristic of English styles including caramel, apricots, raisins, fig and prune flavors. In contrast the kilned malts tend to be malty, bready, cookie-like, biscuity, toasted and sometimes a light caramel but they lack the fruity/raisin flavors. As we get to the dark caramel and kilned malts near the harsh zone (above 70 L), both malts take on a toasted and even burnt character but again the caramel malts will add dark fruit flavors, while something like a brown malt will tend to be more mocha-coffee like. I do urge you to avoid using harsh zone malts in large quantities for the reasons outlined in this article. Pale Ale Malt (2-4 L) – Clean, malty aroma with slight hints of toast. Variants like “Maris otter” offer a bit more character. I encourage you to get more familiar with the flavors these malts produce. One great way to do this is by doing sensory analysis of your malts using the new ASBC method outlined here. It is a fantastic project for a brewing club meeting, or you can do a few at a time at home.